First pages of Baird Diary. Diary approx. 2.25"x3", all in pencil except this page. In honor of the Sesquicentennial of the Civil War, the 150th anniversary of the conflict, we will be posting diary entries from Mr. Matthew Baird dated 1861-1865. Historic Charlton Park is in possession of almost every piece of paper that Baird wrote on during his lifetime, creating a very complete picture of his life while serving in the military during the Civil War. After several years of research and lots of volunteer hours put into his study, we are finally ready to make Baird’s story available to the public! Matthew Baird was born in Baltimore, Maryland in 1839, the oldest child of George W. Baird and Mary Eliza Merrill. He and his family, including younger brother Samuel, moved to Cedar Creek in Hope Township, Barry County, Michigan sometime between 1841 and 1850. The census of 1860 finds Baird living at home. He is listed as a 21 year old farm laborer to his father, as best we can tell. He was very devoted to his parents and the rest of the family at home. He contributed greatly to their financial well-being all through the Civil War and showed a continuous interest in how the farming operation was doing and the price of the commodities they grew each year. Baird was a prolific writer and very eloquent in the many poems that litter his diaries and correspondence. April of 1861 finds Baird having signed up for the war effort, enlisting in Company H in the Third Regiment of the state militia on April 29, 1861 (in his own words). According to sources, he joined the 3rd Infantry, Company E in Grand Rapids, Michigan on May 13, 1861 and reported on June 10, 1861 for duty. 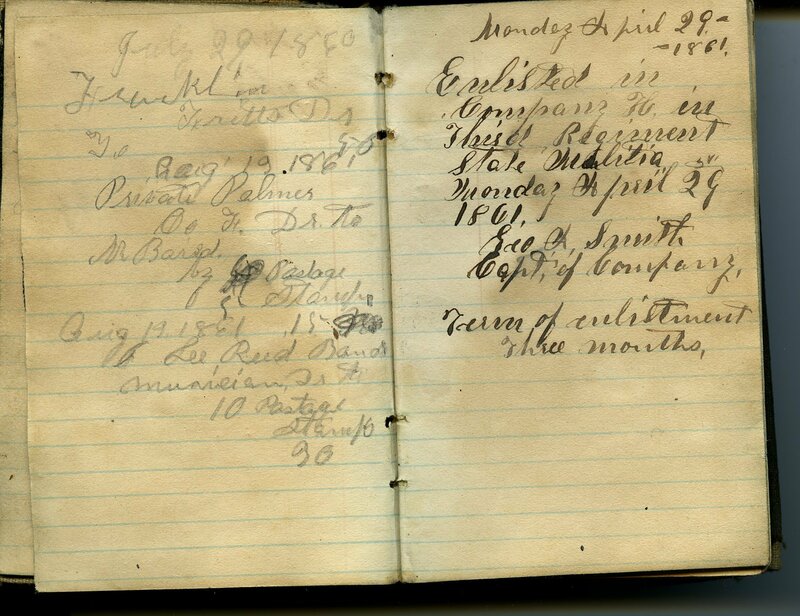 Baird’s diary speaks of different dates for the above, as you will see. His letters and diary show a total and complete loyalty to the northern causes. He sees action all through the Eastern Front engagements as an infantryman. He spent the most of time within about 100 or so miles of Washington, D.C. and the Annapolis, Maryland vicinity. He speaks of the many times he visited the Capitol and witnessed the work of the people’s business in Congress and the House. We will endeavor to post his diary entries on the corresponding dates they were written, starting today, April 29th. Quotes from his diary will appear in italics. More of his story will be revealed as the weeks pass. As of yet, we have not found a picture of Matthew Baird, but hope to have one soon. Where his entries are not sufficient, we will post transcriptions of his letters to fill in the gaps. Many thanks to David Chase, one of our most active volunteers, that tookMr. Baird’s story in hand going as far as the National Archives to finish his tale and for writing much of the above. Also, we are indebted to Gordon Mitchell, a local historian and descendant of Mr. Baird. We hope you will enjoy learning about Baird’s life as much as we have. Enlisted in Company H in Third Regiment State Militia Monday April 29 1861. Term of enlistment Three months. Enrolled my name as a volunteer for three months in the States service at Hastings, Mich. In Company H. Capt Smith designed for the Third Regiment, Michigan Volunteers. During the day took a few (my first) lessons in the military Hardee’s Tactics. There was a great deal of confusion regarding company names in the 3rd Michigan during those early days in April and May of 1861. The company of men from Barry County were to have remained intact but politics and wartime being what they were, it didn’t quite work out that way. Once they arrived in Grand Rapids the Barry County company (often referred to as the “Hastings Company) was broken up and the men allocated to other companies. In fact Company H would eventually be the designator for the Muskegon Rangers. Thanks for your input Steve, I appreciate you taking the time to clarify. I have enjoyed looking over your blog, what a great resource! Just curious, how is Gordon Mitchell related to Matthew Baird?